For most people, it’s not age that’s holding you back from improving your body composition or increasing your performance. Shown are some of my adult women training and nutrition clients repeatedly getting stronger, more mobile/resilient, and leaner over time. Find out the evidence and experienced based reasons why each woman is performing what they are below. VIDEO CLIP ONE: Carol performing a landmine press. Unfortunately, if you can’t raise your arms overhead without compensating somewhere else (eg. lower back), you have no business pressing any type of weight overhead unless you want to increase your risk of injury. Carol is using this angled press to train her shoulders as a substitute for overhead pressing. In the meantime, we’re working on things that will improve her shoulder flexion (arms overhead motion). VIDEO CLIP TWO: Elaine doing kettlebell swings. We can’t ignore that the fact that power declines as we age. The kettlebell swing (done properly) is a great movement you can use to increase power, that’s also low impact (eg. minimal stress on ankles and knees). It’s also a magnificent alternative to jumping or any other high impact lower body aerobic movements. Studies have repeatedly shown that power exercises with lower loads and faster movement velocities, improve functional performance and may even be superior compared to traditional progressive resistance training (Gschwind et al. 2013). VIDEO CLIP THREE: Noreen performing slow eccentric, leg assisted chin-ups. I like this variation of chin/pull-ups, because not only are unassisted chin/pull-ups way too difficult for most people to perform, but also because just about anybody can do these very comfortably. You can make them as hard or easy as you would like according to what your goal for that day is. I especially like them on the rings as they allow your hands to rotate making them an extremely wrist and shoulder friendly movement. Train hard while working around injuries and simultaneously provide a better environment for healing. (Lorenz D, Reiman M, 2011). Get better at positions you’re struggling with, as they force you to spend more time at each specific joint angle throughout your entire range of motion. Develop confidence in your lifts as you can use heavier weight, for more reps, than you could concentrically (Hollander, D.B. et al. 2007). Heighten mental focus and boost your mind muscle connection, which can lead to a magnified understanding of your body, technique, and movement. Reduce boredom and add variety to your training if you’ve never paid attention to the tempo you use during your training sessions. Use this as another tool create more time under tension, training volume, and muscular development where you want or need too (Hather, BM et al. 1991). 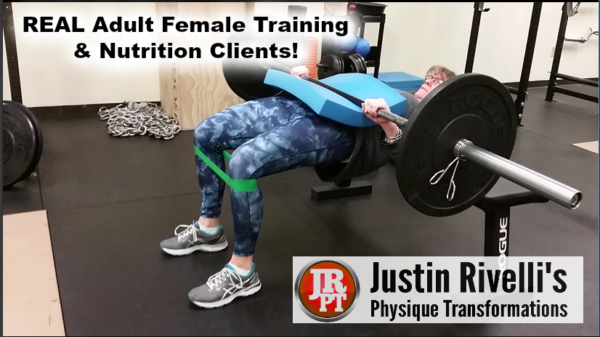 Jackie is performing single leg romanian deadlifts to spare her spine, while simultaneously improving stability, muscle development, and strength in her glutes and hamstrings. I’m having her hold onto a foam roller so that balance is not her limiting factor, which in turn allows her to use more weight. In this specific situation, the foam roller is also used to give Jackie a little less stability than a wall, but more stability when compared to no support or being hands free. Right now, this is her “sweet spot” in terms of still being able to perform the lift, without really worrying about falling over, or compensating with bad form. VIDEO CLIP FIVE: Sara performing rear leg elevated split squats (with her back leg on a band). I’ve been both using, and having clients implement split squats with their back leg elevated on a band, instead of a bench, stand, or pad, for just over nine months now. It’s an amazing split squat variation that causes your front leg to do a lot more work with less external loading. This is always a plus when you’re looking to make an exercise harder, but with less stress on the joints. It also seems to help many people progress into the airborne lunge and skater squat with less difficulty. If you’re interested, I made this video http://justin-rivelli.com/?p=8966 showing some things I’ve learned along the way, and also explaining how to make them easier, harder, and all of the possibilities in between. VIDEO CLIP SIX: Amy performing half kneeling, upside down, overhead kettlebell presses. This joint friendly movement is an exercise many people with cranky shoulders can often perform pain free. This is partly because they allow you to not only train your primary or main mover muscles, but also because they increase recruitment of things like your rotator cuff and core musculature. Additionally, without appropriate spinal and shoulder alignment, they’re just about unworkable. Almost every time a client performs an upside down kettlebell or plate movement, they’re not only surprised with how challenging they are, but how different their strength and coordination is when comparing the dominant to the non dominant hand. This makes these an excellent exercise to help with asymmetries. Upside down movements heighten mental focus against your will, and bully you into maintaining/increasing that level of physiological effort and attentiveness throughout the entire set (as you fatigue physically). Otherwise, you’ll drop the weight and your set will be over. VIDEO CLIP SEVEN: Katie performing barbell hip thrusts. Here I have Katie performing barbell hip thrusts to improve the strength and muscular development of her glutes and hamstrings, while simultaneously putting minimal stress on her lower back. One other reason I love barbell hip thrusts (that I don’t hear mentioned), is that when it comes to using exercises to target your glutes, they actually force you to push against resistance horizontally. What I mean by this, is that although things like deadlifts and there variations are great for hitting the glutes and hamstrings, they don’t provide resistance horizontally or at peak contraction (in this case this is the top of the deadlift). VIDEO CLIP EIGHT: Heather performing a hanging plate bench press. By hanging weights on a barbell, as opposed to placing plates on the end of one, you construct an environment that can serve as a great teaching and training tool for just about anyone. Especially if you want to receive less stress on the joints and more on the muscles you intend to train. If you choose to implement this, you’ll experience unforeseeable and uncertain movements, shifts, and alterations during the exercise. Therefore, this technique heightens mental awareness, causes you to contract just about every muscle on your skeleton, and disciplines you to sustain this enormous amount of tension throughout the entire duration of the lift. The less tightness (“irradiation” or concurrent activation potentiation) in your body, the more the barbell will wobble, and the more it will cause you to shake like crazy, involuntarily. The extra tension this type of training creates can reduce your risk of injury by almost automatically producing joint centration without extra effort of cuing.